Got some new releases that I tasted at the weekend, first and most interesting of which was this new Glenmo. Its part of their series of releases trying new things called Private Edition, similar to what Ardbeg do with their yearly releases. This is their 10th. 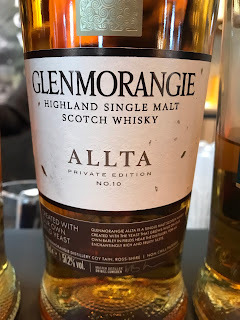 Why I think this release is important is because its one of the only Scotch releases that I can think of where the yeast has been made the main unique selling point. Which I think is really cool. Nose: Pleasant nose of butterscotch and toffee, quite dry and missing the usual Glenmo fruit, plus heavier than I expected, some dried apple, dry straw, malt, herbal honey note. Taste: Very good arrival, quite light to start with a great mouthfeel, then a real honey bomb, sweeter than I was expecting from the nose, toasty malt, toast, dried apple, yellow apple, some white pepper spice. Finish: Medium/Long length. The oak comes in and dries again, honey and toast and butterscotch. From Wild Yeast found in the distillery. Really interesting to try, although I'm not sure what the difference is meant to be to the flavour. It does seem heavier than a usual Glenmo... A little harsh into the finish as it opens up.